Swiftwater Rescue News | Swiftwater/flood rescue information, networking, referral, public safety education, and news coverage. Swiftwater/flood rescue information, networking, referral, public safety education, and news coverage. Floods… Drought… SES Volunteers in Australia need our support! We all seem to be impacted by increasingly complex and pervasive weather extremes these days. For every weather-related emergency worldwide, there are many excellent search and rescue organizations that respond, government-supported, as well as all-volunteer. In Australia ~ the State Emergency Services ~ “SES” ~ is an impressive all-volunteer organization, with a proven track record for lifesaving. SWIFTWATER & FLOOD RESCUE is a critical technical rescue service provided by highly trained and dedicated SES volunteers. Maintaining a swiftwater rescue program during prolonged droughts can be a tremendous challenge. It is no easy task in the best of times, but during droughts, there can be a “What water, what floods?! ?” attitude that can strain both volunteer recruitment and essential swiftwater/flood rescue training. Please lend your support to SWIFTWATER/FLOOD RESCUE programs worldwide! And thank you for providing urgent support at this time to SES volunteers in Australia! The NSW SES Volunteers Association President, Kim Davis, has today announced support for volunteers of the NSW SES experiencing hardship from the current drought. “I have seen firsthand the effects of the drought on our State, our rural people and our volunteers,” Ms Davis said. President Davis has advised that donors can request their donation to the NSW SESVA Welfare Fund be directed to drought support for volunteers. The NSW SES Volunteers Association raises money through raffles to advocate and support volunteers of the NSW SES. The Welfare Fund is available to all volunteer of the NSW SES. Applications by volunteers can be made for support online at the NSWSESVA website. 7. The NSWSESVA has obtained access to financial counselling services available to rural volunteers experiencing drought. ‘‘We are asking that all volunteers look out for one another during this time. Please check on your fellow volunteers and ask if they are OK.” Ms Davis said. The SESVA has sought advice and is working with NSW Government and other Not for Profit charities during the drought to ensure that the right assistance is given in the appropriate way during this lengthy period. The NSWSESVA is a Not for Profit charity celebrating its 20th year of support to volunteers. This support includes advocacy, mental health, welfare and grants. ASHEVILLE, NC, May 25, 2013—The Higgins & Langley Memorial and Education Fund is proud to announce the 2013 Higgins & Langley Memorial Awards, which recognize excellence in the field of flood and swiftwater rescue. This year marks the 20th Anniversary of these prestigious international awards. Awards are presented to swiftwater and flood rescue experts worldwide in several categories: the Outstanding Achievement Award, Program Development Award, Special Commendation Award, Swiftwater Rescue Incident Award, and the rarely bestowed Lifetime Achievement Award. The awards will be presented on Friday, May 31, 2013, at 7:30 PM, at the annual National Association for Search and Rescue (NASAR) conference – Sheraton Myrtle Beach Conference Hotel, 2101 North Oak Street, Myrtle Beach, SC 29577; telephone: (843) 918-5000. Jim Lavalley is a visionary leader, swiftwater rescue equipment designer/developer/tester, and master swiftwater, flood and ice rescue and boat instructor, who has had a worldwide impact on the growth and development of swiftwater/flood/ice rescue as a unique technical rescue discipline. He first garnered recognition in the 1970s as a river guide, running the wild rivers of Canada and providing rescue training to commercial rafting guides. 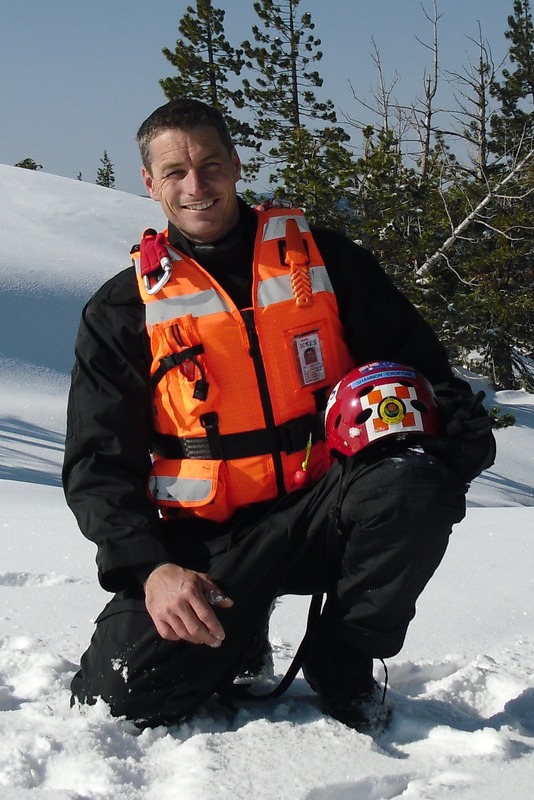 As founder and president of Rescue Canada, Jim developed new rescue techniques to improve victim and rescuer safety based on the International Rescue Instructors Alliance standards. Jim’s swiftwater boat operations programs are the foundation for the majority of training programs taught in Canada and the United States today. Jim has steadily worked to improve techniques, equipment and training programs for water rescue personnel to more successfully aid victims caught in life-threatening swift water. In 1997 Jim formed Force 6 Safety Products and began designing and building equipment unavailable anywhere else, including the innovative Force 6 Rescuer and Instructor personal flotation devices (PFDs) – creating a new standard for high float PFDs designed specifically for swiftwater rescue – and the weight forward Dart and Delta throw bags. In 2012, the new, innovative Force 6 RescueTec was introduced as the first and only PFD to meet the new USCG Class 5 Rescue Professional PFD Standard. Jim has been an international, court qualified subject matter expert since 1988, and continues to be the go-to person for swiftwater rescue problems. He is frequently contacted by public safety agencies and the courts that have swiftwater/flood/ice or boat issues and concerns. Jim has spent his entire career improving safety for people who live, work and recreate around the water. Procedures developed by Jim have been passed down from instructor to instructor resulting in thousands of swiftwater rescue personnel around the world benefiting from his vast expertise and experience. When New York was hit by Hurricane Sandy, the New York City Fire Department (FDNY) Special Operations Command Task Force divided the worst-hit areas of the city into Branches: Breezy Branch, Staten Branch, Rockaway Branch, Far Rockaway Branch, and Broad Channel Branch. In each of those branches dozens to hundreds of rescues were conducted as the storm surge overtook New York City’s coastal zones in a disaster that inundated or washed away entire towns from the Jersey Shore to Nassau County. As the storm hit with full force, at night, FDNY rescue companies, operating in dangerous conditions, with 90+ mile-per-hour winds and churning, chest-deep floodwater, saved people trapped in flooded power plants and residential streets, on rooftops, and in the midst of several conflagrations with buildings burning. Without FDNY’s robust water rescue program, countless lives would surely have been lost during this devastating super storm. On the night of October 29, 2012, five members of the Rockaway Point Volunteer Fire Department’s water rescue unit rescued more than 20 individuals from flooded homes and homes that were threatened by a large fire that claimed over 100 houses at the height of Hurricane Sandy. With their fire station flooded and their fire pumper truck and ambulance submerged, Capt. Michael Valentine, Lt. Brandon Riley, Lt. James Morton, F/F Michael Kahlau, and F/F Brian Doyle deployed two rescue boats and battled through the fierce storm, in extreme conditions, relying on invaluable training and skill to safely rescue everyone. The New Jersey State Police Open Water Rescue Program was initiated when too many law enforcement, fire, and EMS agencies were sending first responders who were unequipped and not properly trained to manage dangerous water rescues, hurricanes and coastal flooding events. Unique to the rescue program is storm surge flood training, which requires specific planning, skill, and capability beyond inland flood and swiftwater rescue training. Since 2006, the Open Water Rescue Program has provided training to more than 1,800 police, fire, EMS, and lifeguard first-responders from over 100 agencies, preparing them for lifesaving missions during the many hurricanes, storms and floods which routinely strike the region. “Rescue for River Runners” is an impressive educational video series that raises awareness within the recreational whitewater community about swiftwater rescue, including self-rescue, river hazards, and whitewater boating safety. 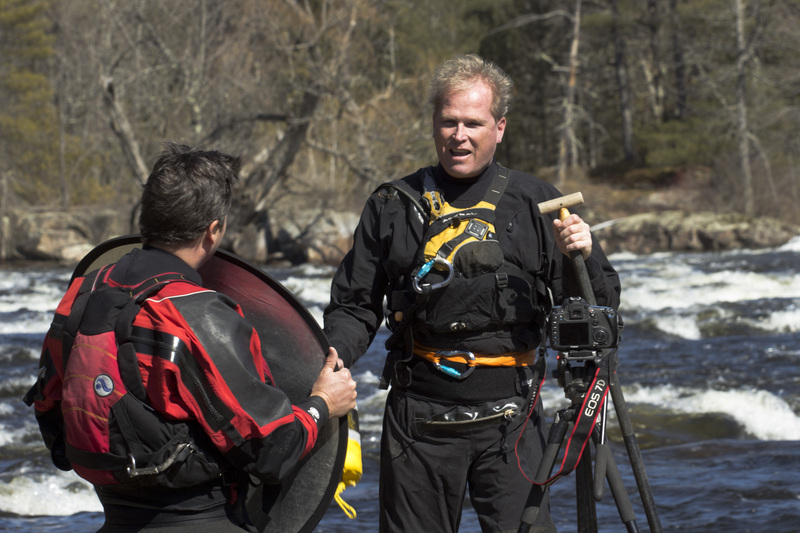 Jim Coffey’s expertise as a swiftwater rescue instructor, and Michael McKay’s skill as a videographer, lend unique authenticity to each episode. The complete series is offered online, which ensures that river guides and paddlers worldwide have easy access to critical lifesaving information to help prevent deaths and injuries. On the night of March 19-20, 2012, the Killeen Fire Department’s Technical Rescue Team responded to a number of swiftwater rescue events in Class 4 floodwaters downstream from a low water crossing over the Leon River. The team’s dedication to training and practice became evident as they evacuated more than 50 victims from rising floodwater and rescued three victims in harrowing danger in the river in a downpour of rain. Each victim posed a different, but equally difficult and hazardous problem. The first was stranded in the churning river on a midstream tree, the second was being swept downstream, and the third was trapped in her car with only a small pocket of air left. The team not only successfully rescued all three victims, but maintained their own safety as well. During the final rescue, the team’s boat became entrapped on a dangerous, submerged “strainer” midstream in the torrent. With the proper equipment and training, swiftwater rescue personnel were able to free the boat and make it to shore safely. That every person in life-threatening danger was rescued is a testament to the Killeen Fire Department’s swiftwater rescue training and capability. On March 25, 2012 North Chatham Volunteer Fire Department received a call for two stranded canoeists on the flood-swollen Haw River. Swiftwater rescue teams from four agencies responded to the scene. Their training was put to the test as they located and rescued these two victims. When problems developed with one of the rescue boats, one rescuer was thrown into the water, one managed to grasp a tree limb, and one was able to stay with the boat. Because of the training and planning by the three responding agencies, both civilian victims and all swiftwater rescue team members went home safely after a job well done. In 1993, Emily King and Paul McMinn were serving as co-chairs of the National Association of Search & Rescue (NASAR) Water Rescue Committee when Los Angeles County Firefighter/Paramedic Jeff Langley lost his life in a tragic helicopter incident. Paul and Emily proposed a modest award, named in honor of Jeff Langley and civilian Earl Higgins. The history of the Higgins & Langley Memorial Award parallels the history of the growth and development of emergency services-based swiftwater and flood rescue in the United States and worldwide. As we mark the 20th Anniversary of the awards, we offer special recognition to our founders, Emily King, an international expert in boating education and water rescue representing the National Safe Boating Council, and Paul McMinn, Assistant Recreational Director, South Bend Parks and Recreation Department, who developed and directed the Indiana River Rescue School for ten years. Slim Ray is an internationally-recognized authority on flood, swiftwater and whitewater safety and rescue with more than twenty years of experience in swiftwater rescue, including course development and instruction with Rescue 3, Canyonlands Field Institute, and the Nantahala Outdoor Center. He has written and lectured extensively on the subject. An active recreational kayaker, he has worked as a raft guide and canoe and kayak instructor both in the United States and abroad. Slim has been involved in the development and management of the Higgins & Langley Memorial and Education Fund – a 501(c)3 nonprofit organization – since its inception. After 20 years, Slim is retiring from the Higgins & Langley Memorial and Education Fund Board of Directors, and we are offering special thanks for his dedication, professionalism, vision, and steadfast support. The Higgins & Langley Memorial Awards were established in 1993 by the National Association for Search and Rescue Swiftwater Rescue Committee in honor of Earl Higgins, a writer and filmmaker, who lost his life in 1980 while rescuing a child who was swept down the Los Angeles River, and Los Angeles County Firefighter Paramedic Jeffrey Langley, a pioneer in swiftwater rescue who lost his life in a helicopter incident in 1993. The Awards have increased awareness about the need for specialized swiftwater and flood rescue training and preparedness. Today, worldwide training certifications have increased and agencies have been inspired to develop viable water rescue programs to protect the public and rescuers alike. The Higgins & Langley Memorial Awards are sponsored by Angel-Guard Rescue Curtain/Los Angeles County Fire Department, CFS Press, CMC Rescue, Inc., Esprit Whitewater, Fire and Rescue Concepts, LLC, K38 Water Safety, Liquid Militia, Mustang Survival, Ozark Rescue Suppliers, Rescue Canada, Rescue ONE Connector Boats, Rescue 3 International/Rescue Source, River Hydrology Designs, Sierra Rescue/Rescue 3 West, Sierra Rescue Tools LLC, SkyHook Rescue Systems, Inc., and Whitewater Rescue Institute, with additional support provided by the Rudi Schulte Family Foundation, Jon Stephen and Karen Langley Stephen, and the family of John B. and Shirley A. Rigg, as well as contributions from many generous individuals, including Marshall Parks and Leonard A. Martin. For the first time ever, the highly prestigious Higgins and Langley Memorial Award for Outstanding Achievement in Swiftwater Rescue will be awarded to an Australian. It is in fact the first time the award has been presented to an individual outside of the United States. Shannon Crofton, recipient of the 2012 Higgins & Langley Memorial Award for Outstanding Achievement in Swiftwater Rescue. Shannon Crofton, a volunteer with the NSW SES and a full-time firefighter with Fire and Rescue NSW, has been honoured with the award for the work he has undertaken as a volunteer in swiftwater rescue training and development. The Outstanding Achievement Award, the premier internationally-recognized award for excellence in swiftwater and flood rescue (background details below), has only ever been presented to an individual on two occasions previously in the 13 years of its history- posthumously to Jeffrey Langley, a firefighter/paramedic and swiftwater rescue pioneer from the Los Angeles County Fire Department, and Tim Rogers, Charlotte NC Fire Department. Shannon was nominated for the award following the swiftwater rescue program he developed and has continued to build in the Sydney Southern Region where he is the Flood Rescue Officer. His approach is holistic and inclusive and swiftwater technicians in the NSW SES have benefited from his experience and research as a result. 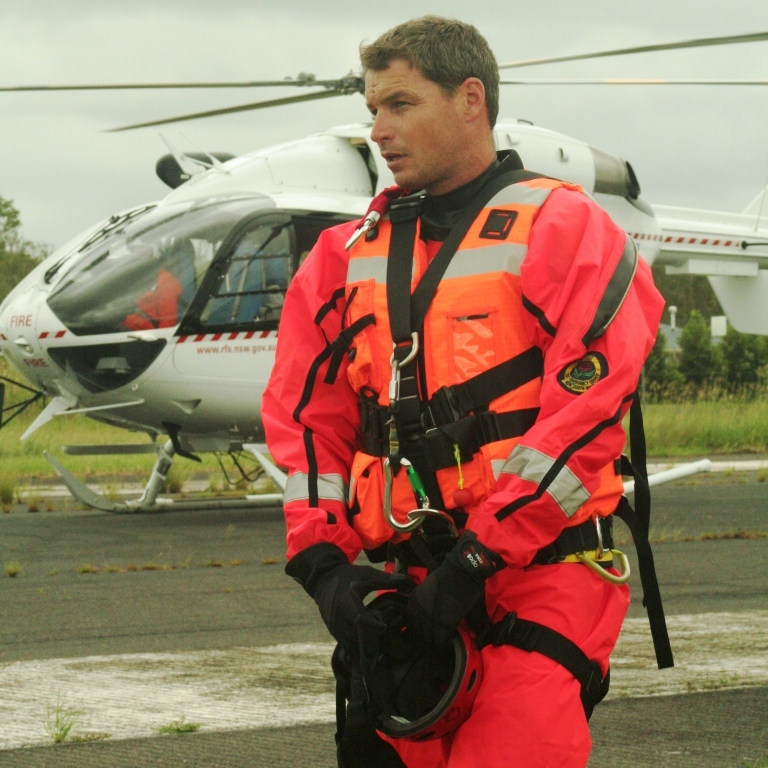 “The extra training that Shannon has provided to the (Sydney Southern) Swiftwater Technicians has substantially increased our capability across the Region and the state. I like that he gives us personalised training, he consults and tailors training to our requirements and in the recent flash flooding across Sydney, that training really helped us execute successful and safe rescues.” Swiftwater Technician, Jason Cocchietto said. He currently runs a monthly training night for all of the Swiftwater Technicians in his region, with an open invitation for other members from around the state to attend and ran a night in-water training session with a vehicle, a scholarship program that was funded through the NSW SES Volunteers Association. “Shannon has recognised the need for ongoing training on a regular basis and filled the gap that previously existed. We get to train regularly, work with the other technicians in our area and practice our techniques in a live environment” Jason added. Shannon is also the recipient of a 2012 Churchill Fellowship, where he will be touring the USA and Canada to research current best practice in helicopter utilisation for flood rescues. This research will supplement the trip Shannon made to the States last June in flood incident management and in-water training techniques. The addition of aviation assets in flood rescue adds a whole new dimension that will be a great asset to the NSW SES. How did you feel when you found out about the award? Shannon Crofton, a volunteer with the NSW SES and a full-time firefighter with Fire and Rescue NSW, is being honoured for the work he has undertaken in swiftwater rescue training and development. I was stunned, but obviously amazingly honoured, when I received the call from the Higgins and Langley Board. To be the recipient of such a prestigious award from my peers in the swiftwater rescue community is such a buzz. Initially it was very much a shock and I feel very humbled to be recognised amongst this field of people. The reality of it took a few days to sink in! So what does the program entail, how does it set the NSW SES apart from other programs out there? The idea of the program is that it is all-inclusive approach to swiftwater and flood rescue. We look at everything from roping work to boat operators, to in-water to boats and helicopters. The programs encourages operators from all areas of swiftwater and flood rescue to work together and more importantly- train together regularly so that we all get to know and are comfortable with each other’s skills sets. A rescue is no time to be learning new techniques. There are also modules in the program that specifically look at the health and safety of the rescue personnel as well as scenarios that use props to assist in the simulation of real rescue situations. I do have to acknowledge the dedication and enthusiasm of the NSW SES members, who work alongside me, turn up for training and support the program. Without them, this wouldn’t have ever been a possibility and their continued support of the program makes my job such a pleasure. Will you be receiving your award in person? Yes, in Lake Tahoe as part of the NASAR conference that I am also presenting at. It will be a pretty huge thing for me because I will be receiving this award in front of the previous and current leaders in swiftwater rescue internationally. There is just so much important work being undertaken in the flood rescue field across the globe, it’s great that we have been recognised on the world scale. What is NASAR and what are you presenting at the conference? It’s the National Association for Search and Rescue. My presentation is on Observations from Australia’s largest flood rescue response and it was just fortuitous that I am there for the presentation of the award as well. So, being the highest award in swiftwater rescue, where do you go from here? There is still a lot of work to be done! Flood and swiftwater rescue is a dynamic environment. A lot of work continues being undertaken in this field to reduce the risk to rescuers. Basically, we can always make something good better, so we need to not rest on our laurels and ensure we keep up to date with world’s best-practice as new techniques are discovered and make sure these techniques are integrated with our training programs. There is also the need to increase the education of the public. Preventing the need for rescues is so important, and it only comes through educating people about the risks they face. You only have to look at the ‘No Way Out’ program that was rolled out into schools in LA, California. The implementation of this program into schools and in line with their curriculum dramatically cut the number of deaths in that age group during the storms in Los Angeles. So, while this award is amazing, the swiftwater program is far from complete! The Higgins & Langley Memorial Awards are acknowledged internationally as the premier recognition for accomplishments in swiftwater and flood rescue. The awards were established in 1993 in honour of Earl Higgins, a writer and filmmaker who lost his life in 1980 while rescuing a child who was swept down the flood-swollen Los Angeles River, and Jeffrey Langley, a Los Angeles County Fire Department firefighter-paramedic and swiftwater rescue pioneer, who lost his life in a helicopter incident in 1993. Incident Award – A specific incident may be recognized. Essential criteria are actions that clearly demonstrate outstanding skill and preparedness in a swiftwater rescue. Multiple awards may be presented in a calendar year. Special Commendation – Recognizes the breadth of possible contribution in the field of swiftwater rescue. Awards of this type can be for media contribution, product innovations, strategic planning, individual heroism or esprit de corps. Results are reflected within the swiftwater community and/or the general public. Multiple awards may be presented in a calendar year. 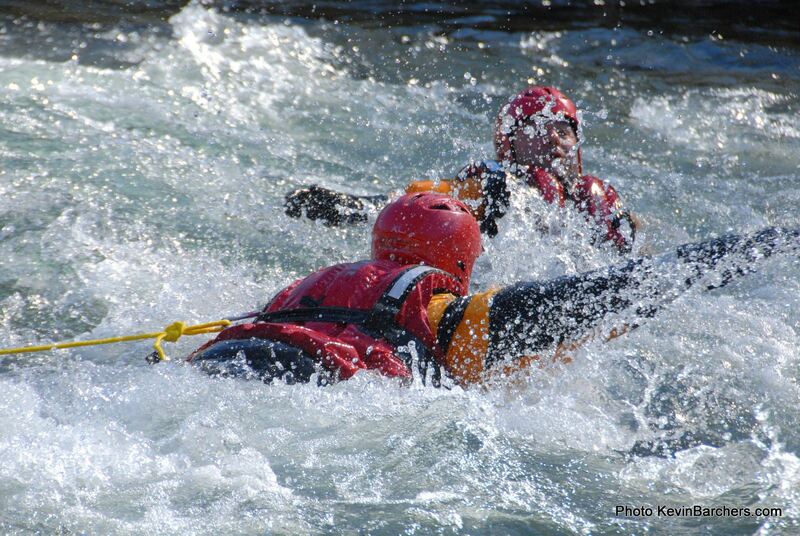 Program Development- Presented to individuals or agencies that commit time, resources and training for successful swiftwater rescue program development. Programs must reflect a level of excellence that defines ‘state of the art’ deployment for swiftwater and flood rescue, and can be considered international models for the science. Long-range outcome is a fundamental criteria. Multiple awards may be presented in any calendar year. Outstanding Achievement- Is the premier internationally-recognized award for excellence in swiftwater and flood rescue. It signifies an intense dedication to the field and a genuine desire to benefit the larger community responsible for the service. Safety and competence are key criteria. Only one award may be presented in any calendar year. Lifetime Achievement- Reserved for those few individuals who make a significant, lasting and continuous impact in the field of swiftwater rescue. Criteria include time-honored or notable results. Lifetime Achievement Awards are rarely awarded. The Higgins & Langley Memorial Awards are sponsored by CFS Press, CMC Rescue, Inc., ESPRIT Whitewater, Fire and Rescue Concepts, LLC, K38 Water Safety, Liquid Militia, Mustang Survival, Rescue Canada, Rescue 3 International/Rescue Source, Rescue ONE Connector Boats, Sierra Rescue/Rescue 3 West, Whitewater Rescue Institute, and SkyHook Rescue Systems, Inc. Additional support for the awards is provided by the Rudi Schulte Family Foundation, Jon Stephen and Karen Langley Stephen, and the family of John B. and Shirley A. Rigg, as well as contributions from other generous individuals. April 17, 2012 (Bellingham, WA) – Mustang Survival will be supporting the Higgins and Langley Memorial and Education Fund at the 2012 Fire Department Instructors Conference (FDIC) to bring awareness about the increased need for water rescue professional education and preparedness. This annual industry conference and exhibit focuses on educating firefighters and water rescue professionals on the latest topics in the industry. The Higgins and Langley Memorial Awards honor outstanding achievement in swift water and flood rescue. The fund recognizes preparedness, teamwork, and a job well done, often under extreme conditions, and promotes training, which is vital to the success of rescue missions, as well as the safety of rescue personnel and the victims. The awards were established in 1993 by members of the Swift Water Rescue Committee of the National Association for Search and Rescue (NASAR) in honor of Earl Higgins, a writer and filmmaker who lost his life in 1980 while rescuing a child who was swept down the flood-swollen Los Angeles River, and Jeffrey Langley, a Los Angeles County Fire Department firefighter-paramedic, who lost his life in a helicopter incident in 1993. Mustang Survival will be showing in its booth the video Ready for the Storm, created by award-winning documentary filmmaker Nancy Rigg. Ready for the Storm won a Gold Award from the prestigious independent film and video competition Aurora Awards for the realistic documentation of swift water rescue professionals and the danger they face. Mustang Survival will also be showcasing its latest water rescue solutions, including two new dry suits. Attendees can also see Mustang Survival’s Water Rescue Kit in action in the Grainger Industrial Supply booth #1341 on Friday, April 20 at 4:00 pm and Saturday, April 21, at 12:00 noon. For more information, visit Mustang Survival in booth #536 or visit http://www.mustangsurvival.com. For more information about Higgins and Langley Memorial and Education Fund visit http://higginsandlangley.org. Mustang Survival has been providing lifesaving solutions for over 45 years. Through constant innovation and application of new technologies, Mustang is the leading supplier of quality flotation and hypothermia protection products to the most demanding users – from fishermen, sailors and commercial mariners to the Coast Guard, First Responders and fighter pilots. A 25-year old, off-duty police officer in Ireland – Ciaran Jones – lost his life in an act of selfless heroism, when powerful storms lashed the East Coast of Ireland on October 24, 2011, causing widespread flooding. According to news reports, Jones was in a vehicle with his brother, Alan, and a close friend, approaching Ballysmuttan Bridge, which spans the River Liffey. Jones noted that the river was flood-swollen, threatening the safety of the bridge itself, as well as any motorists who might unknowingly try to drive across it. Jones stepped out of his car and headed towards the bridge to warn other motorists to turn back. Sadly, he somehow got caught in the rising torrent and was swept downstream. Ciaran Jones lost his life in raging floodwaters, protecting others. Officer (Garda) Jones was a four-year veteran of the gardaí, based at Stepaside in County Dublin. 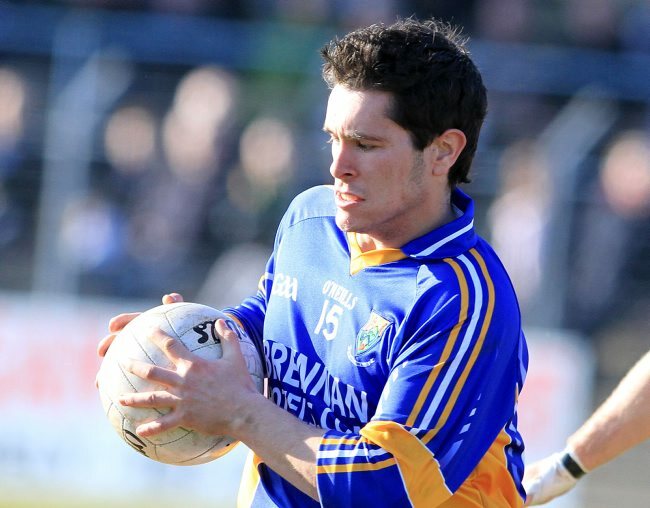 A funeral mass was held for Jones in Manor Kilbride, Co Wicklow, on Friday, October 28, 2011. Jones is survived by his parents, Brenda and John, a younger brother and sister – Alan and Michelle – and his girlfriend, Clare Kennedy, who spoke at the mass about meeting Jones when they were in their teens and falling in love. In addition to his police work, Jones was an accomplished “footballer,” playing rugby with the Clondalkin rugby team. Michael Kenwood, Swiftwater Rescue Team. Photo Courtesy of Princeton First Aid & Rescue Squad. 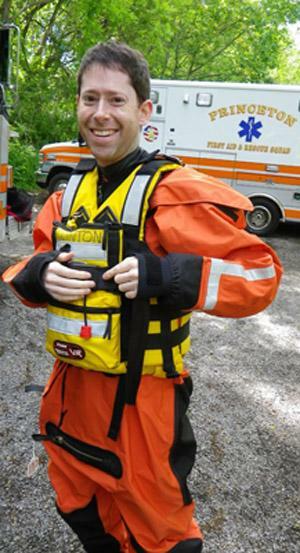 Michael Kenwood, an EMT with the Princeton First Aid & Rescue Squad, lost his life in the line of duty while attempting a nighttime swiftwater rescue on August 28, 2011, as Hurricane Irene inundated much of New Jersey. 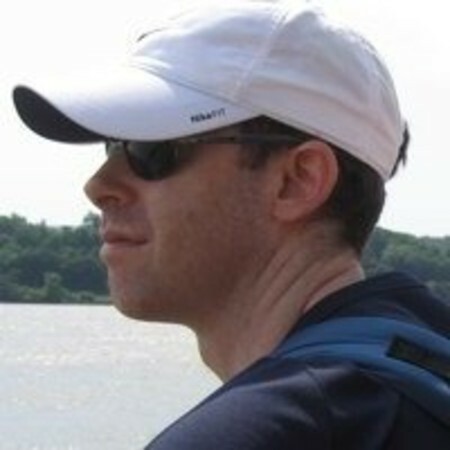 The former director of the Brandeis Emergency Medical Corps (BEMCo), and alumnus of the Brandeis Class of 1994, was 39. According to news reports, Kenwood and a fellow member of the swiftwater rescue team were responding at 4:30 in the morning to reports of a vehicle that authorities believed was occupied and being submerged quickly in rapidly rising floodwaters. It is unclear exactly what went wrong, but Kenwood was somehow swept into the powerful torrent and pulled, unconscious, farther downstream. He was quickly transported to University Medical Center at Princeton. While under treatment in the ICU, unfortunately, there were errors in reporting his death prematurely. He died one day later, on August 29th. According to a Brandeis University memorial article, Kenwood earned a law degree from Boston University and owned his own company, Kenwood Technical Consulting. He is survived by his wife, Elizabeth Frenkel, and 3-year-old daughter, who live in East Windsor, NJ. “I will never forget the feeling of fear and helplessness that swept over me as I looked from my two friends, one of whom was unconscious, to the hysterical driver of the other car, to my right wrist, which was deeply lacerated and bleeding heavily,” Kenwood wrote. “I swore to myself that if I lived, I would learn the skills to care for myself and others should another medical emergency ever confront me again. Sadly, it was in service to others that Kenwood lost his own life. Kenwood is the fourth swiftwater rescuer to die this year, within a deadly and tragic two month time period. Search and Rescue (SAR) volunteer, Sheilah Sweatman, 29, drowned on June 29th during a recovery mission in the Goat River near Creston, B.C. 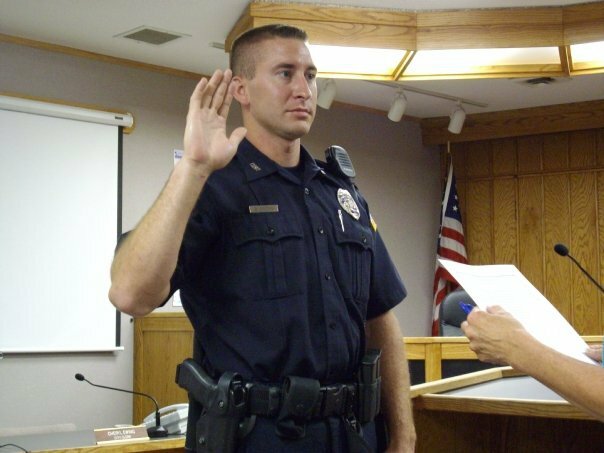 Converse County Sheriff’s Deputy Bryan Gross, 29, lost his life on July 28th, during a river rescue incident on the North Platte River in Wyoming. And Missouri State Trooper, Frederick F. Guthrie, Jr., 46, and his K-9 partner, Reed, were swept away in a powerful flash flood on August 1st. Reed’s body was recovered, but, sadly, Guthrie is still missing. Kenwood is one of at least 45 deaths in 13 states that have been attributed to Hurricane Irene, with the majority of losses caused by powerful inland floodwaters, the churning surf along the coastline, and falling trees. It is with deep sorrow that we must report yet another public safety, line of duty loss in the swift water environment. 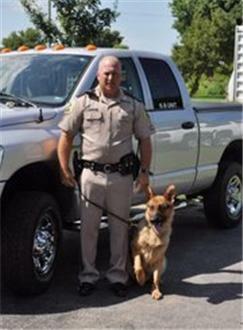 Missouri State Trooper, Frederick F. Guthrie, Jr., 46, and his K-9 partner, Reed, have evidently drowned in powerful floodwaters, according to Colonel Ronald K. Replogle, Superintendent of the Missouri State Highway Patrol. Patrol K-9 Reed’s body has been recovered, but Trooper Guthrie remains missing. According to Highway Patrol reports, on August 1, 2011, Trooper Guthrie and Reed were working Missouri River flood duty in Holt County, Missouri, when they were both apparently swept away in a raging torrent. On Tuesday August 2, 2011, at approximately 6:25 p.m. K-9 Reed’s remains were recovered approximately 100 yards from where Trooper Guthrie’s Patrol truck and boat were located. Reed was a five year K-9 veteran with the Patrol. The recovery effort for Guthrie has been ongoing for nearly one week since he and Reed were swept away. A support fund has been established to assist the family of Trooper Guthrie, who is a 17 year veteran trooper. Guthrie leaves behind a wife and three children. The support fund has been established at the Bank of Weston, Missouri. The address is Post Office Box 8, Weston, Missouri 64098. The funds should be sent to the bank in care of the Guthrie Family fund. The death of Trooper Guthrie marks the third line of duty death in swift water within the last six weeks, and K-9 Reed’s death marks the first on duty canine death. 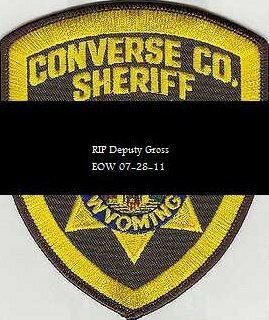 Converse County Sheriff’s Deputy Bryan Gross, 29, lost his life during a river rescue in Wyoming on July 28, 2011. And Sheilah Sweatman, 29, of the British Columbia Search and Rescue Association lost her life in the Goat River during a recovery operation on June 29, 2011, near Creston, BC, in Canada. More must be done to protect law enforcement, fire rescue and other officials serving in flood zones, or deployed to missions involving swift water. It is hoped that comprehensive investigations of these recent tragedies will yield improvements in flood and swiftwater rescue preparedness for all public safety agencies nationwide. It is with great sadness that we must report a second line of duty death, within one month’s time, involving swift water. Converse County Sheriff’s Deputy Bryan Gross, 29, lost his life on Thursday, July 28th, during a river rescue incident on the North Platte River in Wyoming. Gross died just one month after Search and Rescue volunteer, Sheilah Sweatman, 29, lost her life during a swiftwater rescue mission in the Goat River, in British Columbia, on June 29, 2011. Deputy Gross and other rescuers attempted to save the life of a distressed 14 year old teenage girl who entered the river and was swept away. The girl was rescued about a mile downstream. Despite intensive search efforts, Gross’s body was not recovered until four days later on July 31st. Because of heavy snow melt, the North Platte River has been running higher than usual, with very cold water, making it extremely dangerous. There have been numerous drowning deaths in Wyoming this year, including a family of four from Colorado who were killed when the highway beneath them was suddenly washed out during a heavy rainstorm. 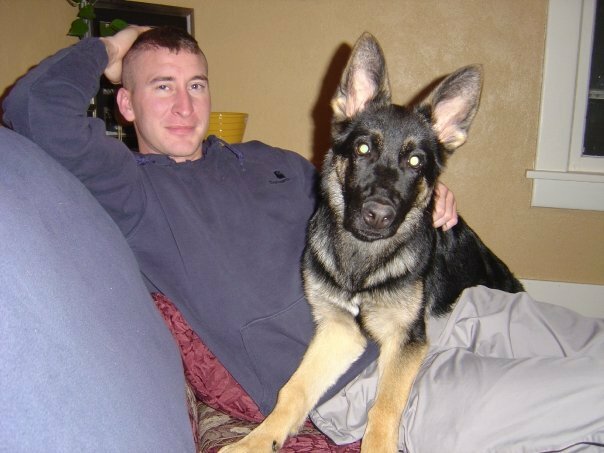 Bryan served with the Converse County Search and Rescue and was a K-9 handler. Bryan Gross was recently married, leaving behind a young widow. In addition to his patrol duties, Gross was a K-9 handler and served with the Converse County Search and Rescue Team. His police dog, Gus, helped search for Gross’s remains. Funeral services were held on Saturday, August 6, 2011. The Gorman Funeral Homes – Converse Chapel of Douglas – has been in charge of handling the arrangements. In remembrance of Deputy Bryan Gross. Amy Gross c/o, CCSO, 107 N. 5th St. Douglas, WY 82633. 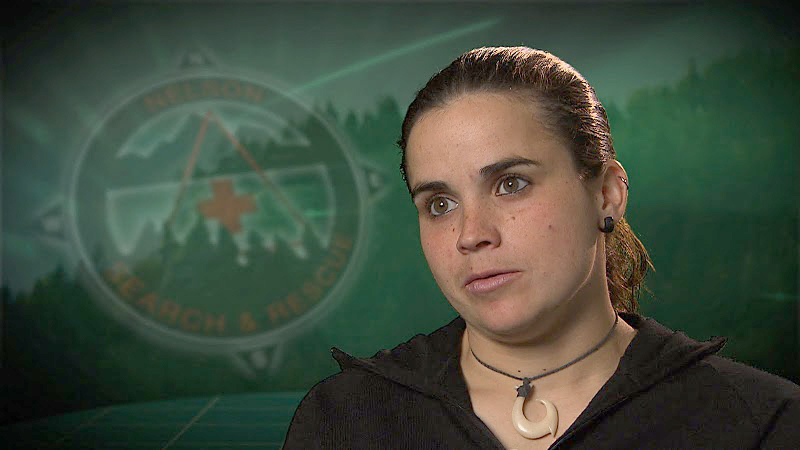 Search and Rescue (SAR) volunteer, Sheilah Sweatman, 29, drowned Wednesday, June 29, 2011, during a recovery mission in the Goat River near Creston, B.C. Sweatman’s body has been recovered. The search for the remains of the initial victim, Lana Chipesia, 23, of Creston, has been suspended, due to the dangerous conditions in the river. News reports indicate that her family understood Sheilah Sweatman’s sense of commitment to search and rescue, as well as recovery operations in water. A coroner’s investigation is underway. Speaking on behalf of families who have had loved ones missing in open water, or whose loved ones are currently missing, none of us would ever want a rescuer to die in pursuit of a recovery operation. The potential danger must not serve as an automatic excuse for doing nothing, however. Finding and recovering the physical remains of a missing loved one is often a vital step in the grief recovery process for surviving family members. There must be a sensible, safe, and compassionate balance in this decision making process. We offer sincere condolences to Sheila Sweatman’s family, friends, and fellow SAR specialists, including swiftwater rescue team members. You are all in our thoughts and prayers at this difficult time. For the first time, custom designed HIGGINS & LANGLEY AWARD TEE SHIRTS and BASEBALL CAPS are available for purchase. The CAP is 100% brushed cotton twill, with an adjustable fabric tab back – with a brass D-ring slider. Official baseball cap, with Higgins & Langley Award logo. 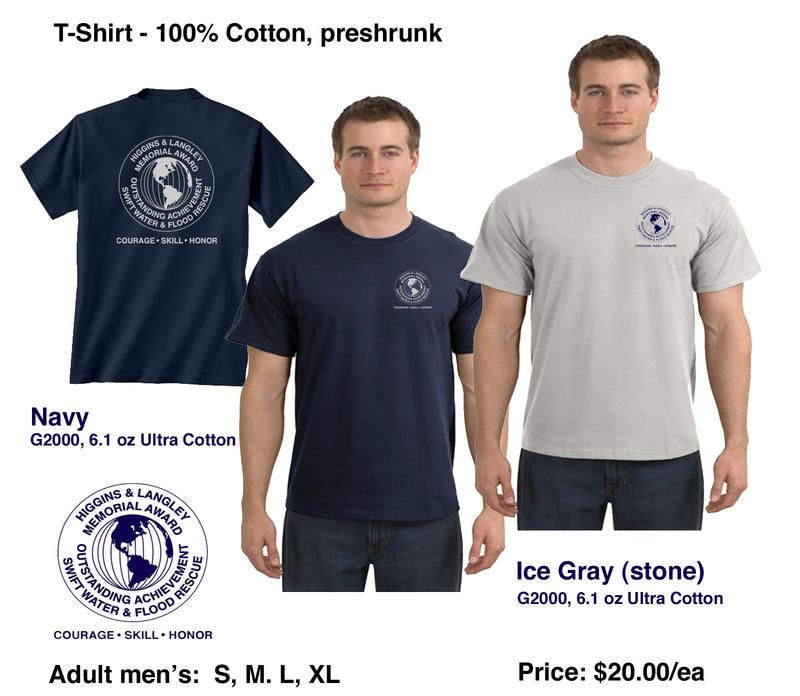 The tee shirts feature the Higgins & Langley Award logo, plus the motto: Courage * Skill * Honor. Official Higgins & Langley Award tee shirts. The cost is $20.00 (US) each, plus shipping. Our sponsor, Rescue 3/Rescue Source, is handling the orders for us. 100% of the proceeds go to support the Higgins & Langley Memorial and Education Fund, including the Higgins & Langley Award in Swiftwater Rescue. Thank you for supporting our fund raising efforts to sustain these important awards. Thank you for supporting the Higgins & Langley Memorial Awards and our other important education programs.